Welcome to anybody new tuning in toady. This month I have been sponsored by Minerva Crafts and I have made up a kit for card making to get you started if you have never tried it before. There is a lot of fun to be had with some vintage style paper, glue and scissors. Here are some of the cards you can make from the kit. Weaving ribbons and making ribbon flowers and bows. Button embellishments on paper off cuts. Flowers made from spirals of paper curled round and round. Vintage paper used as a background to recycle some old artificial flowers. Paper folding techniques are great fun too. I found this one here. You can also use the paper squares to make a wreath like this one I made for a friend for Christmas. There is a lot of inspiration on Pinterest. Go and take a peek, they are really easy to do with children too. The kit includes sharp scissors, foam pads and tape. A pack of 50 cards, a pack of vintage paper, some ribbon and some little paper flowers. All you need to make your family and friends cards for the coming year. Seriously, I need to get a grip of my Works In Progress. (WIP's) I have some projects which I started and then the cabin came along and now I have started thinking about that all the time and I have stuff all over the place. A doily which my neighbour had trouble with. I have eventually after four pineapples, worked out how to do the point at the end. Nice book, not mine, but I really must not choose any more things to put on my wish list. Although, saying that, I like the blanket border for another WIP. Unfinished curtains, just need the ribbons putting on the hems. £5 charity shop bargain - full length cream curtains, they are for the cabin so no rush for those yet. Oh yes and don't forget the picnic blanket because I am a fighter not a quitter! OK so it no longer has wedding present potential but to use up old stash and learn new stitches, it has been the perfect project to do with Chrissie and Marianne's CAL. 9 squares? enough for a cushion cover do you think? Knuckle down Jo and stop thinking about girl's cabin quilts, crochet covered jam jars with candles, painted wooden trunks, an old directors chair in the shed and other such fripperies. STOP! Hot off the back of yesterdays news, I bought a 1950's kitchenette off ebay on Saturday for the cabin. It was £40 and I reckoned I couldn't get a cupboard from IKEA for that with as much shelf room. We went to Wrexham to pick it up. We had a swim with the girls at Plas Madoc swimming pool - the squealing at the wave machine was such a pleasure. It was not such a pleasure to try and squeeze a cupboard into the car with two small girls, car seats and swimming bags with the boot tied down with a piece of string. Little M was frozen by the time we got home an hour later. Anyway, less of the sob story, I am guessing you want to see it? The drop down door was missing so she had covered it with a tea towel but it was already painted red and white, it was just a bit scruffy. The original glass was in the doors but just needs a bit of securing. So not bad all in all. Little M and I went to get supplies today. Woodworm spray, paint (on the damaged shelf - £3) and a very super new brush, which cost more than the paint! I sawed off some of the legs because they were a bit uneven and it was wobbling. Now I know all you vintage lovers might swoon at the original vinyl but I want to cut a salad and make a sandwich on there so it had to come off - it had a sort of smell - woodbines and colmans mustard I would say. Very pretty though - enjoy the photo because I have ripped if off and replaced it. oh cripes,the afternoon is ticking away, the kitchen is a bomb site, my helper has absconded to children's TV, Big Sis comes home in an hour ready for swimming lessons and I need to get a grip on the domestic situation. Normal service has been resumed and there is a shepherds pie in the oven. 10 mins to blog I think... Phew! It was Ginx Craft. A new blogger to me who I found through Chrissie. Go and check out her amazing knitting creations. I love the shell best. Family News 2014? So have you been wondering what it might be? Well we have spent my car fund on a wooden cabin/chalet/shed to put up at my dads farm so that we can mess around up there when we want. It is beyond exciting for all of us. That is why Bloke bought me this book for my birthday. For those who weren't checking in here last summer, we had a trailer tent at my dads (now, not working) farm and when the weather was OK we went up and lit a fire, messed around etc. They were real family adventures full of walks, marshmallows, pond dipping, motorbike riding and being out under the stars. We went in high summer a few times when it was all lush and green. Then later we went in the early Autumn foraging. Now, I am not talking garden shed. We went all out and bought one 20 x 16 ft. Big enough for bunk beds, kitchen bit and lots of room for blankets, cushions and all sorts of other stuff. 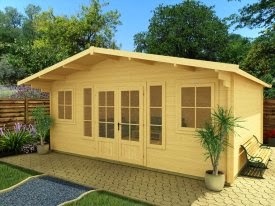 The cabin will be out of sight in a nice private place, not spoiling the view. My dad is really pleased too because he plans to build a house there soon when he is better so when he lives there we can go and see him at weekends. He bought us a stove to put in it last week. EEEK! I am just beyond grateful. We are not going to be particularly 'shed chic' (I can't, I am penniless now) but in my usual guise of making new things from old things we will get by and you can come along the making journey too cabin friends - your ideas are always welcome. What do you think? Here is a fun one... I am playing a game, it is quite futile, selfish but ultimately fun: I have 92 followers but the day I get 100 I will put all the commenters from that day into a hat and draw for this card for you to send to your loved one. You can be anywhere in the world, just leave your lovely comments as usual whether you are a regular or newbie. So spread the word, I would love to see eight more crafty bloggers join me so that I can join them in their creative lives. My birthday presents over the weekend this year reflected two things - my love of all things crafty and the ability of my family and friends to really know me inside out. Vintage Amber earrings from my best mate. Chutney labels, shower gel and a lovely floaty scarf. I am wearing it so it is hard to photograph. From my friend who shares my love of all things second hand. From my next door neighbour - do you think she can hear me swearing through the wall when my sewing goes wrong?! My brother and his family gave me these cooking inspired things. My mum lives close by and visits often, she knows what it feels like in this house! I think I could be interviewed and it would not give as much information about me as this generation-game-conveyor-belt-style list of gifts. Today I have been preparing to sew a new piece of clothing for myself, a coat no less. I cut out the paper pieces in .. you guessed it April 2013 so yesterday as the sun shone thorough the window and made our very cold house feel cosy, I cut out the fabric. Just sumptuously lovely buttons aren't they? I had an idea to machine embroider a pattern on the collar with my flower making foot but thought better of it, but it was good fun to play. Instead I bought some trim today which I might edge the collar and cuffs with but the jury is still out on that one. So nothing is sewn as of yet, just two days preparing to sew. I am trying to enjoy the process and not think about when it will be finished and that feels good. I have some fab craft presents to share with you that I had for my birthday and I have our big family news for 2014 to tell you too but that will have to wait. I didn't really want to tag my title with the usual Hooray! because the reason I finished my shawl yesterday is because Little M was poorly in the night and had to stay home from Pre-school so I have been pootling, tidying and mothering. They are called 'sick blankets' in this house for a reason. Then she fell asleep, the sun came through the window upstairs and I had a little sit down in the afternoon for an hour. I made up this droplet edging which I am quite pleased with. Blocking out 92 little bobbles with pins was not so much fun but it passed away the evening. I added little beads too to help weigh down the droplets, all different ones. I gambled how much yarn I would need for an edging and I was pretty spot on considering at the point of stopping the main shawl to make the decision, I had no idea what border I was even going to do. I like to live life on the edge! This is what was left...Phew! Somehow I don't think this will be my last Elise shawl. A little break and a shuffle through my thin yarn stash and I am sure I will find more wool calling out for this oh so easy pattern.